Ever crave some frosty-cold ice cream, but for one reason or another (lactose intolerance, diet, trying to eat clean and healthy) you end up not indulging? Well, here is a healthy, clean, raw and living solution for you! It’s a recipe I create back when I was a raw and living foodie and I call it, “Vanana-Banilla Ice Cream” – you know, like a cross-between banana and vanilla? I’ve also made variations of this (butter pecan, strawberry and of course, chocolate) which I’ll share another time. A funny story about this. My youngest child was pretty much born when I was eating raw and so, he grew up a “raw baby” until I decided to reintroduce cooked food into our diets. Anyway, one day we went to the mall and we stopped by the ice cream shop inside. Basically, he was so accustom to the ice cream I made at home, that’s all he knew and all he wanted! It was so cute! A soft-serve ice cream that can be made quickly and easily! Process all ingredients in food processor until creamy and the consistency of soft serve ice cream. Serve immediately. Variations: Top with chocolate sauce (blend carob or cacao with agave, vanilla and a little water) or pulse-chop in strawberries or other fruit or nuts. 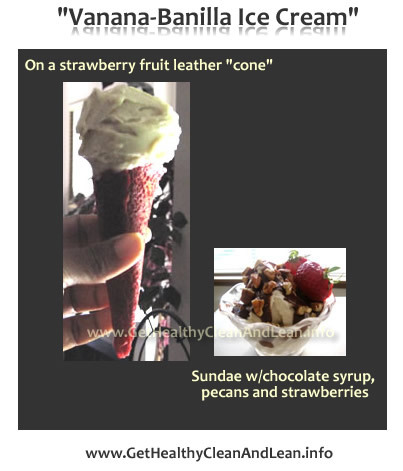 Can also blend carob or raw cacao to make chocolate flavored ice cream!